These are part of an ongoing photographic series of trees in urban environments, mostly Indian laurel fig trees, a Southeast Asian species planted along neighborhood streets all over Los Angeles. With their smooth bark and humanoid forms, these hardy immigrants have an animated presence; they bear artifacts of human activity, and often push back dramatically against the urban infrastructure of concrete and asphalt. I replace the backgrounds with a flat color gradient, as if I had brought the tree into a portrait studio to pose in front of a backdrop. See images and more information about the series below. "Etant Donnés (Tree, Los Angeles)"
"Little White Hat (Tree, Los Angeles)"
"Big Bird (Tree, Los Angeles)"
in Downtown LA (one shown center). Background: I first noticed rows of strangely humanoid Indian laurel fig trees along a busy Los Angeles thoroughfare, after family members moved there in 2012. On subsequent visits, I realized they are widely planted. 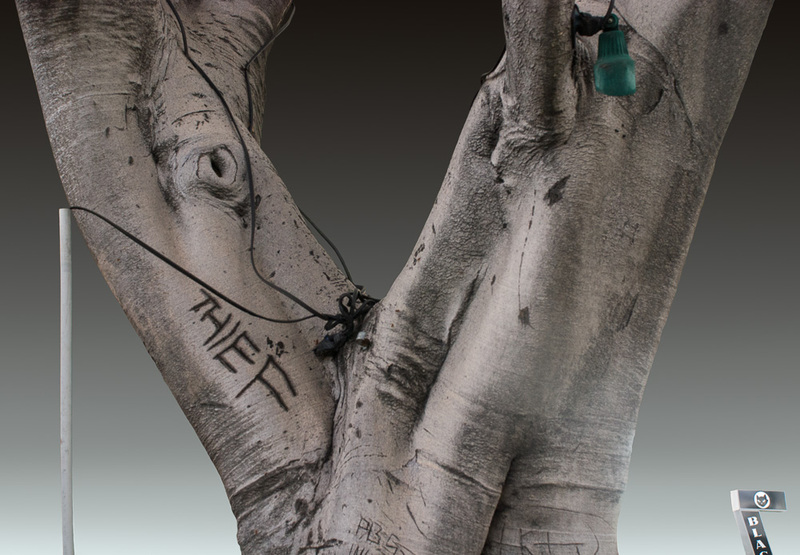 Whether in a low income neighborhood or Beverly Hills, they endure similar treatment: bearing the scars of adaptation and interaction with humans — staples, nails, wiring and streetlamps, bits of torn posters, and providing a seemingly irresistible surface for graffiti carvers, who turn them into tattooed bodies. I have photographed them repeatedly and my series has gradually grown to encompass neighborhoods all over LA. Eventually I discovered that they are a non-native Southeast Asian shade variety, frequently used as a street tree in Southern California; my research turned up a government report that indicated that Ficus microcarpa 'Nitida,' as they are known to botanists, comprises 5% of the trees in Los Angeles. My underlying motivation is to find beauty in an unexpected place, complexity and layers of experience in something we think we already know, underlying relationships in what at first glance seems random, and experiences that cannot be fully described verbally. I search for a deeper understanding of what natural forms tell you about the particular conditions of the moment, and in the case of the Indian laurel figs, they frequently push back forcefully against the infrastructure built to contain them, cantilevering sidewalk slabs at sharp angles, curling their roots over curbs, and swallowing power lines. They're survivors, bearing the traces of time's passage and the indignities visited on them, still standing. I have also turned one of my photo sets from Los Angeles into a 3D file using photogrammetry, and produced it as a sculpture. Occasionally I photograph trees in other cities as well.